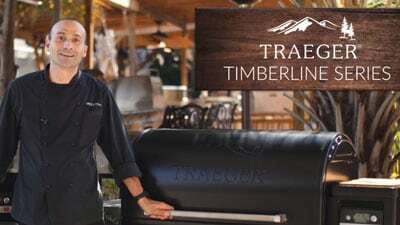 Traeger was one of the first and continues to be one of the biggest names in pellet grills. Traeger wood pellet grills were invented in 1985 to fill the need for slow-cooking food over wood. Cooking with charcoal or gas doesn’t give food the flavor that you can achieve when slow cooking with hardwood. This increasingly popular cooking method allows the flavored smoke to be infused into the food. With the Traeger Pro Series, you can grill, bake, roast, braise, and barbeque in addition to low and slow smoking. Pro Controller - The Pro Controller makes maintaining the ideal heat easy. The Pro Series 575 & 780 add a digital controller that connects to the Traeger smartphone app so that you can monitor temperature and cooking conditions from anywhere. Simply set the desired internal temperature of the associated meat probe and your phone will alert you once your food is done cooking. The Pro Controller dispenses pellets to keep the grill at a consistent temperature within 15 degrees of the desired setting. The temperature is monitored by a sensor that takes 60 readings per minute and makes adjustments as needed. All-terrain wheels - The all-terrain wheels allow the grill to be moved through rocks, gravel, grass and dirt with ease for when you want to bring your grill to new grilling locations. Meat Probes - Dual meat probes allow you to monitor internal food temperatures while the lid is closed—preventing heat from escaping when opening and closing the lid. The Pro 575 & 780 have a single meat probe. Hopper - The hopper on the Traeger Pro Series makes it easy to change pellets when you want a different taste. Instead of scooping the pellets out by hand or having to use them completely before starting to cook with a different wood flavor, all you have to do is open the back door and empty the hopper. Traeger App - The Traeger mobile app is available to all Traeger users. The app allows monitoring and adjusting of temperature from your smartphone and gives you access to the Traeger community, allowing you to connect with other Traeger owners, learn or share new recipes, and explore new grilling techniques. Accessories - Original Traeger wood pellet grill accessories allows Traeger to continue to support their Pro Series grills with multiple flavors of Traeger hardwood pellets, covers, insulation blankets, cold smokers and more. To learn more, check out our Traeger Pro Series Pellet Grill Expert Review. If you’re interested in Traeger pellet grills but not sure which one is right for you, use our Traeger Grill Comparison Chart to compare the Trager Pro Series vs. other Traeger grills. Or call our experts at 1-877-743-2269 to figure out which grill is perfect for you!